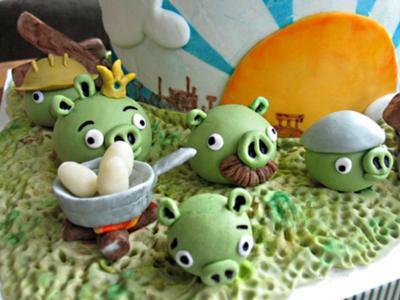 What a fun birthday theme Angry Birds would be! I love seeing all the different Angry Bird characters and that sling shot adds the perfect touch. Such a creative cake with so many details. The birds were made out of fondant and the only thing made out of modeling chocolate was the slingshot. Jaime mentioned, "It was just a quick cake I did for a friend's birthday." For the majority of us...this definitely wouldn't be a quick cake, but I would love to try to make some of those birds to decorate a cake for my girls. After seeing this cake, my daughters said they would like their next birthday theme to be Angry Birds. I'd like to give special thanks to Jaime who is the creator of this really cool cake! She recently competed on Food Network Challenge Best in Show Cakes. Creative Angry Bird Cakes...One big red Angry Bird and three little ones make this cake scene. 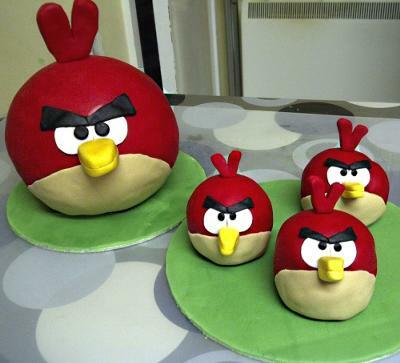 Perfect for each person to enjoy their own angry bird cake. 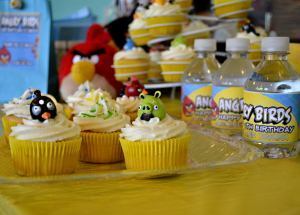 Thank you for allowing Perfect Parties to showcase your cute Angry Birds cake idea! They are almost too cute to eat. 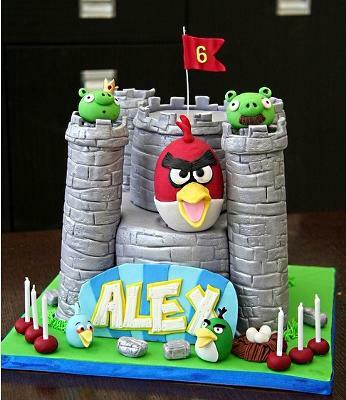 What a neat Angry Birds cake with a castle, pigs and red bird. The flag is a cute idea for showing the age of the birthday child and I love the candle holders. 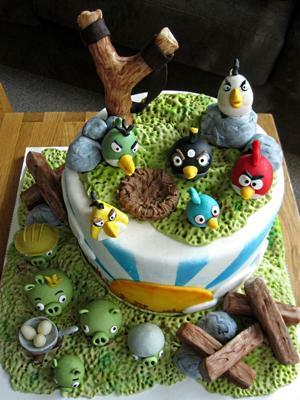 This definitely would be a fun cake to have for an Angry Birds theme! Special thanks to Audrey for allowing us the use of her Angry Birds cake photo. 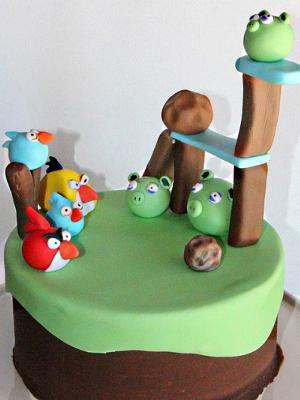 This Angry Birds cake features the funny green pigs and the red and yellow bird in such a cute arrangement. 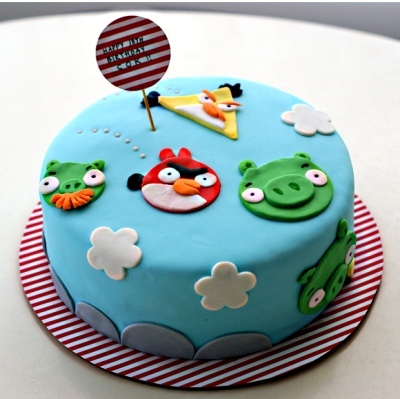 This round cake is covered in sky blue fondant and then decorated with clouds and the Angry Bird characters. Thank you Lyndsay for allowing us to share such a creative cake! 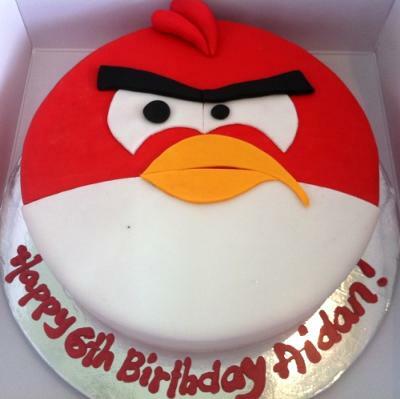 Look at this really cool Angry Bird Cake! The toppers were from the Artisian Cake Company on Etsy. What a great way to decorate a cake with your favorite characters! The bottom layer is chocolate avocado cake with milk chocolate frosting. The rock wall is yellow cream cheese cake with milk chocolate frosting and chocolate Satin Ice fondant. 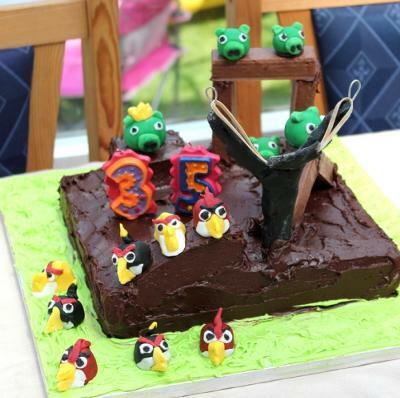 Thank you Shari for allowing us to publish your Angry Birds Cake Photo. I had never thought of finding cake toppers on Etsy! What a great way to make the perfect cake. I would think this would be a great time saver too if you have a lot of characters to make. This cute Angry Bird scene looks like one right out of the game with red, yellow and blue birds ready to take on the green piggies! 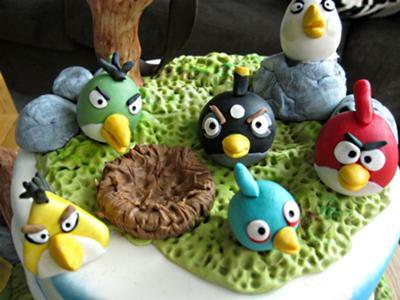 A fondant covered round cake with hand shaped Angry Birds will be a wonderful cake for any fan of this popular game. 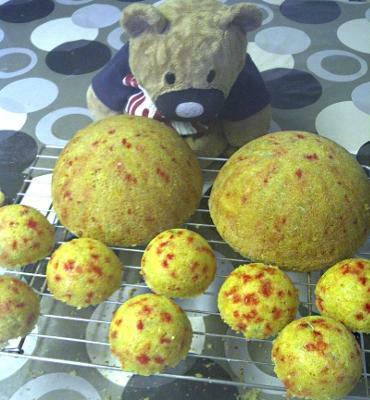 We would like to give special thanks to Jo a mum who has a passion for baking for allowing us the use of her cake photo! 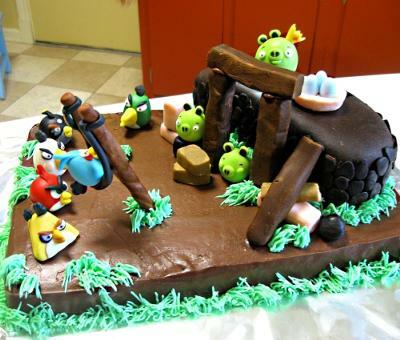 This Angry Birds scene was created on a chocolate frosted sheet cake. The birds look ready to take on the green pigs in the cool handmade slingshot! The figures are made out of fondant and arranged not only on the cake but around it. Great use of the cake board! This wonderful photo shared with permission from James. Thank you very much!! A fondant designed Red Bird covers this entire round cake. This cake is an eye catcher with the vibrant red. Fonadant offers such clean cut lines that make the features stand out. This is such a perfect cake that would be fun to have at any party!! Thanks for the permission to use this cake photo!! 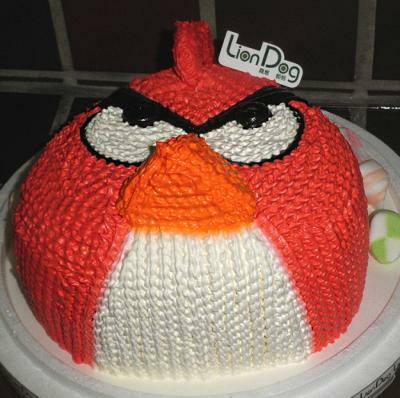 Here's a neat red Angry Birds Cake Idea!! A round cake with the face created with frosting tips. The neat thing is it still has a 3-D effect with the beak and head feathers standing up. What a great "angry expression" on his face! Thank you Wally for allowing us permission to share your cake idea. The latest fun cake making idea are cake pops!! 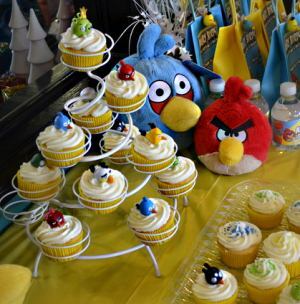 What a perfect idea for an Angry Birds kid birthday theme. Whether you choose to make pigs or these cute red birds, your child and friends will have fun eating these. 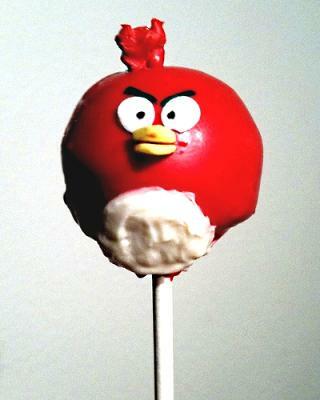 Thank you Sheila for allowing us the use of your Angry Bird Cake pop photos! 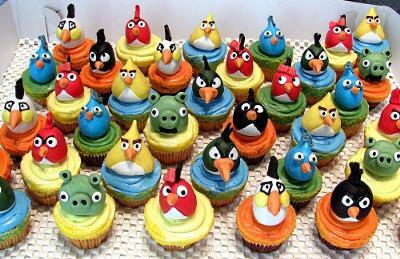 These cute colorful cupcakes are perfect for an Angry Bird birthday party. Make your favorite bird or all of them...included here are all of the birds! 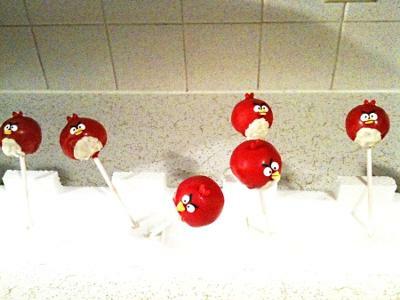 These cute angry birds are made with edible with fondant & buttercream. The cupcake toppers were a big hit and even though we had a cake...many chose to have a cupcake so they could keep their Angry Bird topper. We found these at Amazon. They are sturdy and made of what appears to be wood or a similar material. The cupcakes were home made and we used a Buttercream icing recipe from Wilton. A number 1 Star tip was used to design the swirls. We started the swirl from the outside of the cupcake working inwards and then squeezing and extra bit in the center and pulling the tip up. Sprinkles and the Angry Bird toppers were then used for the final touch!